Click to read my blog. 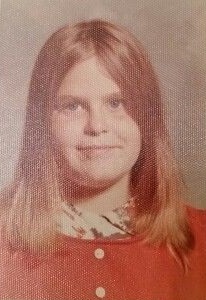 By the time this picture was taken at the age of ten I was a bona-fide book lover who spent hours reading Nancy Drew and Little House on the Prairie. Several important people shaped my love for books. Most importantly, my wonderful book-loving mother took my sisters Nancy, Kathy and me to the library every week. Thank you, Mom! My next door neighbor and babysitter Mrs. Hopkins loved crossword puzzles and trained me to spell-check for her as she filled in the puzzle blanks. She kept three monkeys in cages and they would chatter and pull my hair through the bars as I looked up words. Thanks Mrs. Hopkins for teaching me to love words and spelling. Monkeys: thanks for the nightmares. Luckily, my grandmother Mama Chris sewed me a sock monkey around that time, teaching me the only monkeys a girl can trust are those that started out as undergarments. My love of books and words led me to teaching. I have lots of fun reading to and with my class, helping them take AR tests on books they have read and finding great books in the library together. In case my principal is reading-- we do math too. I do a lot of my writing on my Nordic Track treadmill desk. How do I walk and write? The answer is I walk very slowly, about a mile an hour. Believe it or not, walking slowly helps me write very quickly. Sometimes I even exercise on my treadmill like normal people do. I turn the speed way up and pretend monkeys are chasing me. In addition, I'm a Past President of Kern Reading Association (KRA), a chapter of California Reading Association (CRA). I'm a recipient of the 2016 Armin R. Schultz Literacy Award for Writing that Promotes Social Justice as well as CRA's Margaret Lynch Award. All those serious titles mean I get to have lots of fun with other writers, and, if I'm lucky, I get to wear a tiara and sash.